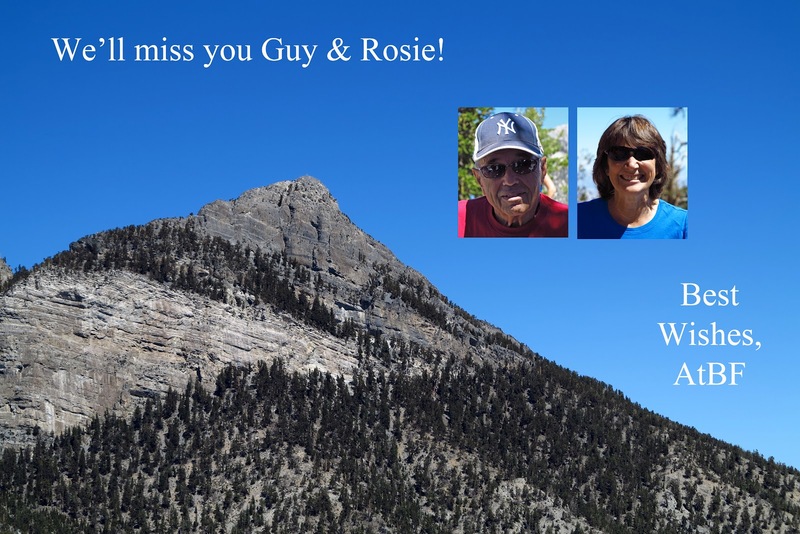 Guy and Rosie are long standing members of the AtBF club and we will miss them dearly as their lives move on to California. Cheers to both of you! A whopping thirty-nine hikers took the trails today as we said good-bye to two of our members who have been with the club for a long time. Guy, who has been the longest member of the club, and Rosie, who has been with us for several years, are on their way to California to be near family. We hope to see them again on future excursions and we wish them the very best in what is to come. Taking a break at the North Loop meadow. 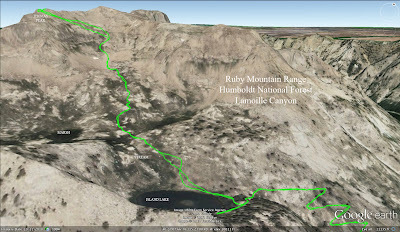 Our 3.5 mile hike called Wild Horse Ridge began at the North Loop trailhead. Most of the club members were very familiar with this first section of the hike and everyone was able to spread out from trailhead to meadow. 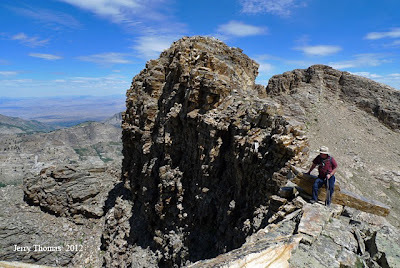 We all appreciated climbing the 1000 feet in elevation at our own pace and eventually, we all made it up while others took a wonderfully long break among the meadow's bristlecones and views. Long line of hikers approaching Wild Horse Ridge. 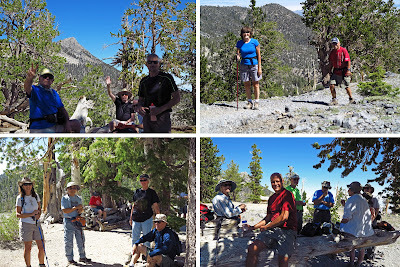 After the extended break, we gathered again for a group descent on Wild Horse Ridge. Turning right just past the old bristlecone in the corner, our long line of hikers first hiked out the wooded small trail, passing the turn off for Wild Horse Canyon. Finally, at an indistinct junction, we turned downhill toward the beginning of a long thin ridge topped with caliche rock. On the right side of the ridge was Wild Horse Canyon and on the left was Deer Creek Canyon. Supporting its given name, there was much evidence of wild horses in this area. (Also, at least one elk!) 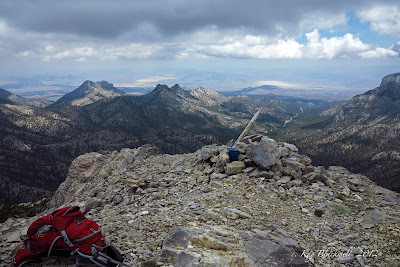 We hiked down the ridge taking in a huge amount of views including the view behind us of Mummy Mountain and the view in front of us of several dry desert lakes, or playas. At the end of the ridge, we dropped off of the rock and hiked down to the dirt road that runs up beside Deer Creek. We turned right, reached the highway and walked the final quarter mile back to the North Loop trailhead. What a beautiful day! Finishing the hike on the Deer Creek dirt road. Sculpture outside a home in Old Towne. 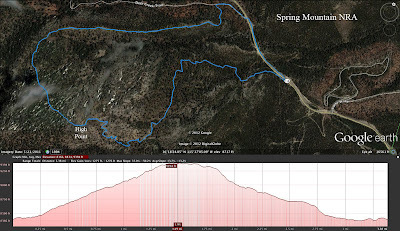 The hike today was a four mile downhill pleasant stroll starting at the Echo Trail parking lot off of Echo Road a short distance from Kyle Canyon Road. Twenty-one hikers started down the Kyle Canyon drainage that runs parallel to the highway and went under the bridge that services cars going up to the Cathedral Rock trailhead. Our drop in elevation for the morning would be around 900 feet. Utilizing different trails and old forest roads, we made our way down toward Old Towne, one of the residential sections of Kyle Canyon. Before we entered the small group of old interesting homes, we passed by a small cinder block building with rebar for windows. It is nestled right next to the paved highway yet camouflaged enough to be hidden from drivers. We explored the little building and went on our way. Another interesting addition to a home in Old Towne. We hiked down the road in Old Towne where there were many interesting mountain homes. At the end of the dirt road, there was a school where a small number of very lucky children are taught in the elementary grades. After the school, there is a short informational trail hoping to help the residents there to be prepared for possible forest fires and diseased pine trees; two hazards that are surely important to the people living there. Taking a break at the campground. We connected with part of the Rainbow Loop trail, passed Rainbow, then entered into the first campground where we took a snack and bathroom break. To the west, we could see Mt. Charleston towering behind the campground in the distance. As we continued down behind the Visitor Center, we entered the drainage itself. It is here that we found the St. John's Wort yellow flowers as seen in the photo below. It is a shrubby perennial plant with bright yellow flowers. St. John's wort was named because the flowers were said to bloom for the first time around June 24, the birthday of St. John the Baptist. The word "wort" means "plant" in Old English. As we approached the second campground, we could not help but notice the dreaded orange construction fence blocking our way. For some hikers, this was not a deterrent. However, there is a $275 fine for those who are caught beyond the fence and some hikers decided to go up to the road to pass the fenced area. 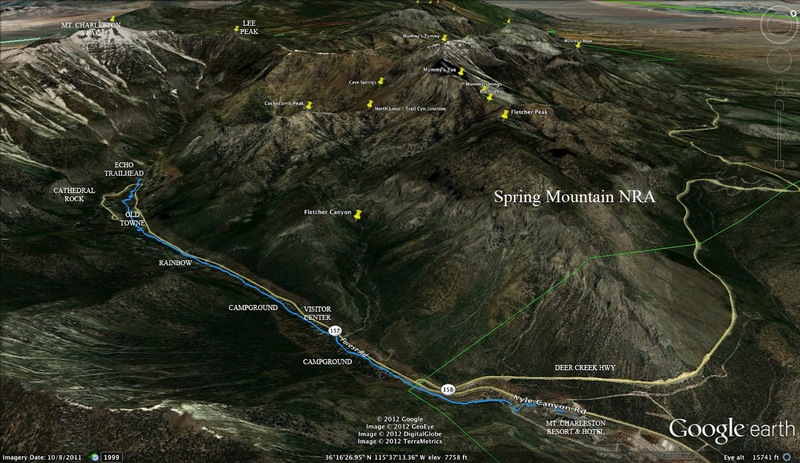 The scheduled date of completion for the updated campground is December 31, 2013. The drainage went from a twenty foot wide wash to a fifty foot wide wash after the second campground. We hiked down this part as the sun was getting very warm on our shoulders. Soon, we connected with the old Mt. Charleston golf course which no longer appears as such. There was a steep paved uphill path here that led us to the parking lot of the Mt. Charleston Resort & Hotel. We gathered our cars that were placed for a point to point hike and returned home. Sculpture outside the Mt. Charleston Resort & Hotel. Panorama taken during our break from Lee Peak. Today's Super Tuesday Hike found seven Around the Bend Friends on a 13 mile hike up 3100 feet of elevation to the summit of Lee Peak on the North Range of Mt. Charleston. 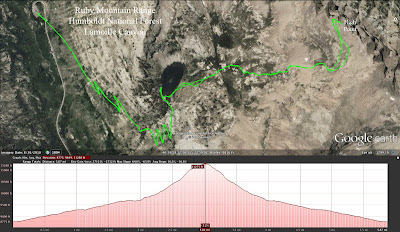 Lee Peak is not an official peak because it does not rise up far enough from the surrounding range. But, for seven hikers, today, it WAS a peak! We started up Trail Canyon from the new parking lot and tried to ignore the menacing clouds that shrouded the peak of Mt. Charleston as seen to the left. Trail Canyon went by pretty quick. The ground was soft due to a rain there yesterday. Everyone was anxious to get the day started fast in case rain decided to "come again another day" ... like today! When we reached the North Loop Trail junction, we took a break to wait for everyone to catch up then started up the North Loop. The first landmark was Cave Spring. Here, there is a water trough built into a hollowed out log. A pipe carries the spring water to the trough. The North Loop switchbacks through a large stand of aspens after the spring. 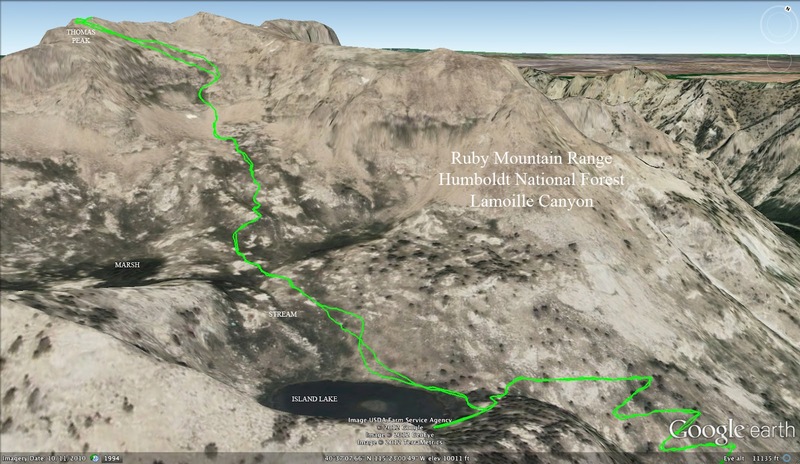 This brings the hiker high above the Kyle Canyon floor. Many cliffs and very steep scree fields can be seen below the trail. 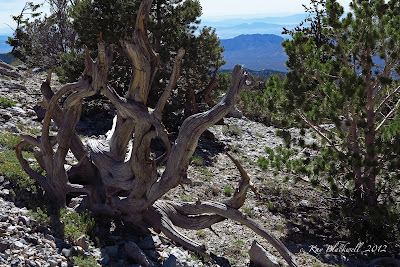 There is quite a bit of exposure along the trail as it undulates below the ridge. 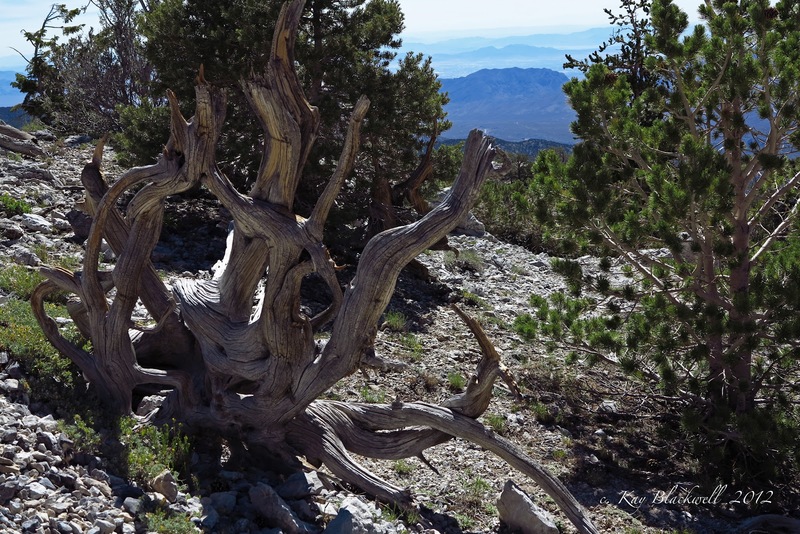 There are three or four places where the hiker comes to a place where he or she can see Lee Canyon on the other side of the ridge. Finally, just before we would round the corner to the left to begin the approach to the final ascent on Mt. Charleston, we stopped then took a hard right. We had reached the Lee Peak turnoff. Not far up through the trees and scree, there was a peak begging for the feel of human hiking boots. So up we went. We were now over 11,000 feet and the air was thin. This final climb was NOT a piece of cake! Nevertheless, Mt. Charleston seemed to be laughing at us from under the clouds so we were not to be out done. The peak had beautiful views all around. We took our break in the cold wind and enjoyed a few jokes. We were still slightly concerned about rain so the break was of limited time and we started down. Needless to say, the "down" was a bit painful. Six miles down on a continuous pace with five breaks takes a beating on the ol' bod'. Finally, we found the cars just where we left them seven hours earlier. Quite a hike and never a drop of rain. Thirty-eight members of the Around the Bend Friends hiking club traveled to Elko, Nevada using one of five different routes. The shortest route rounded out at 432 miles traveling up Hwy 93, Hwy 318, Hwy 93, Rt 229 through Secret Pass and, finally, west on I-80. Lamoille Canyon is located approximately 30 miles southeast of Elko where we stayed at the Red Lion Hotel and Casino. (Unless otherwise indicated, photos by Kay Blackwell.) This excursion was skillfully coordinated by Chris and Diane Dempsey. After our meeting Monday night, we knew to meet in the parking lot for a 7:30am departure to Lamoille Canyon. We piled into several cars and drove out to the Lamoille Canyon recreation area. As soon as we entered the canyon we knew we were in for an absolutely gorgeous week full of hiking. There were high limestone cliffs and canyons. There was a lot of water flowing down the canyon and falling off of the cliffs. And, greenery was everywhere in the form of grass, bushes, trees and flowers. Boardwalk built to avoid mud from the flowing stream. 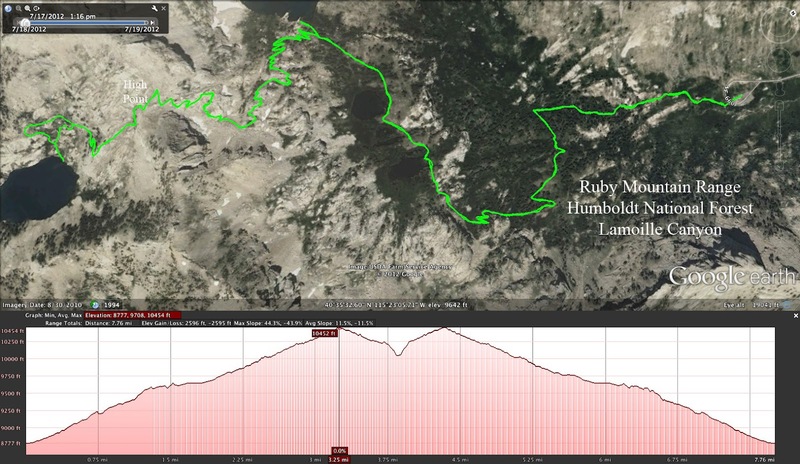 We drove to the end of the Lamoille Canyon road to a large parking lot that serviced some trailheads including the one for the Ruby Crest Trail. This is a trail that travels approximately 54 miles from one end of the Ruby Mountain Range to the other. We started out on this trail heading for Liberty Lake which was around four miles up and over Liberty Pass which reigns at 10,400 feet in elevation. We hiked up beside a flowing stream and into the woodlands for a while. First of three Dollar Lakes with reflection. About halfway up to Liberty Pass, we hiked by three small lakes called the Dollar Lakes. Cameras came out. A beautiful reflection of the mountains could be seen in the first lake. The second lake curved around behind some thick foliage. And, the third lake had a tree living on a small island in the middle of it. Wildflowers were all around and the whole scene was colorful and lush. Third of three Dollar Lakes with island tree. 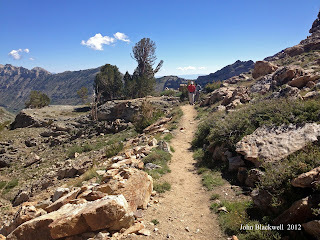 Soon after the last Dollar Lake, we climbed past the stock trail junction. The stock trail allowed horses and their riders to come up from the parking lot in a straight shot through the canyon to this point. 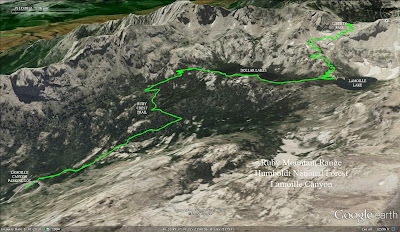 Another quarter mile or so and we were passing Lamoille Lake. This was, perhaps, the most beautiful lake as it was situated at the foot of the mountains that still dripped snow melt into the water. 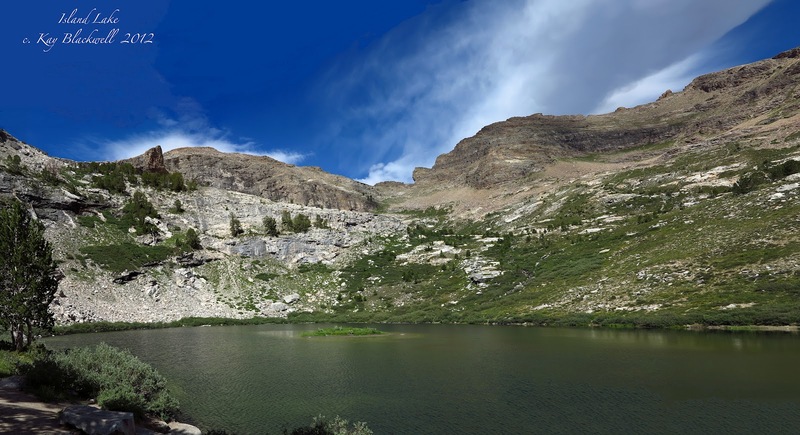 Lamoille Lake seemed to be a popular destination for local day hikers and their dogs. 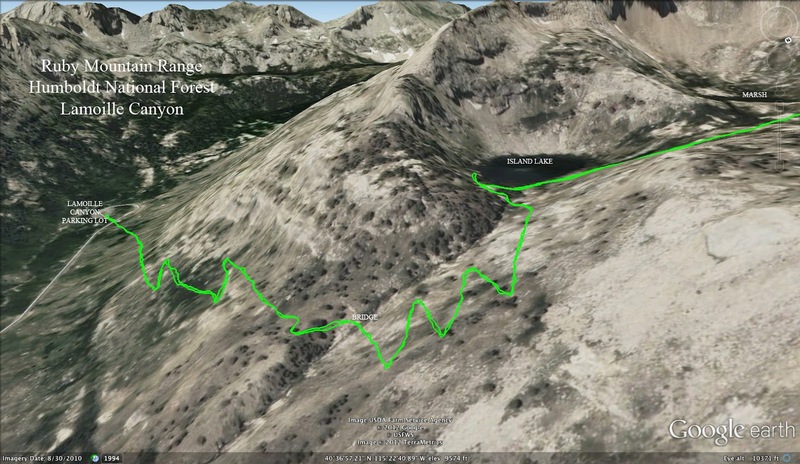 After getting our photos of the alpine lake, we began a series of switchbacks up the final climb to the Pass. When we began the hike, we had divided into two groups. This first group made quick work of the switchbacks excited to reach the top where the views promised to be fantastic. Along the way, the hikers in the front of the line saw a marmot just before it disappeared into its hidey hole in the nearby rocks. 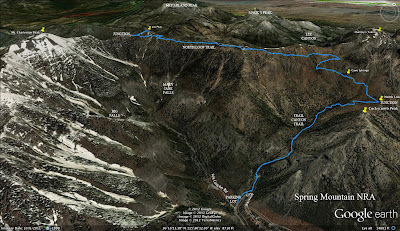 Climbing the final switchback to Liberty Pass. We hiked over Liberty Pass and continued down another quarter of a mile to an amazing overlook of Liberty Lake. 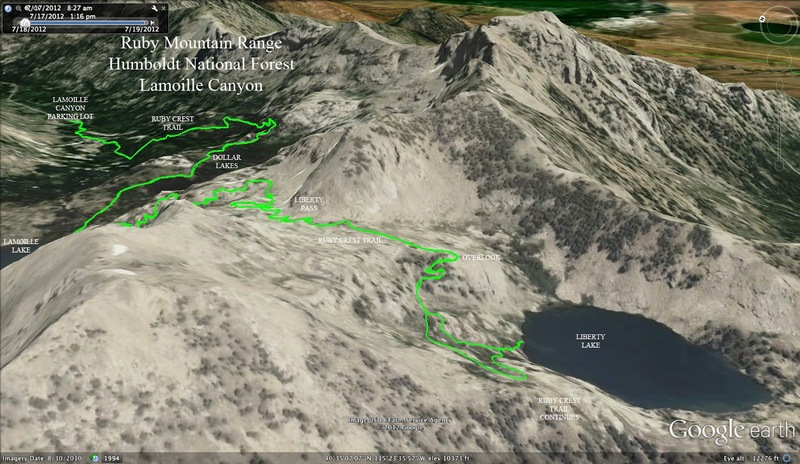 We could see the turquoise colored lake below, another smaller lake on a higher tier in the distance and the Ruby Crest Trail circling around to the left leading into more beautiful mountainous surroundings. At least three hikers decided to stop at the overlook for their break while the rest of the group continued down to the right to reach the lake shore. A sign indicating the Ruby Mountain Wilderness/ Lamoille Canyon boundary stood between the Pass and the overlook. This probably meant that restrictions on camping overnight stopped there. Two backpackers passed the group on their way out to an overnight trip. We asked them about bears and they said that black bears have only just begun to make their appearance in the Ruby Mountains. They are probably a pretty rare sight at this time. 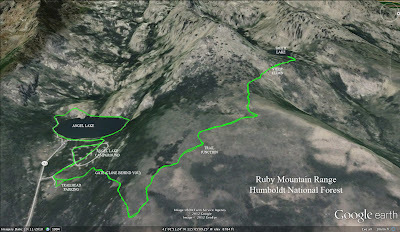 Club members hiking down to Liberty Lake. However, mountain goats were introduced to this area some time ago as game and are now flourishing among the limestone cliffs. We didn't see any of them, nor any of the big horn sheep that are supposed to be in the area. The second group of hikers had made it up most of the switchbacks by this time and were taking their break in the shade. After their break, many of them continued on to the overlook and some of them joined us for the trip back down. At this point, hikers from our group were spread out between Liberty Lake and the Dollar Lakes. 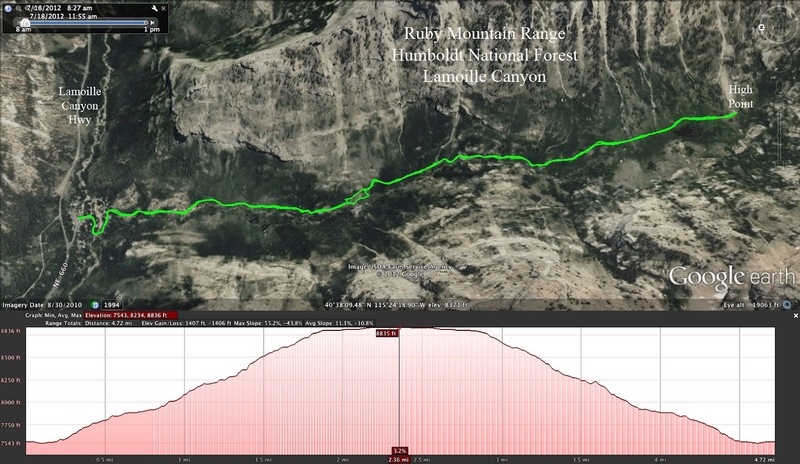 Ruby Crest Trail near Liberty Pass. As we continued down the trail, we passed day hikers who were out with their children and dogs. The hike down was just as enjoyable as the hike up and, at the last stream crossing, several of us decided to remove our hiking boots and dip our toes into the ice cold water. 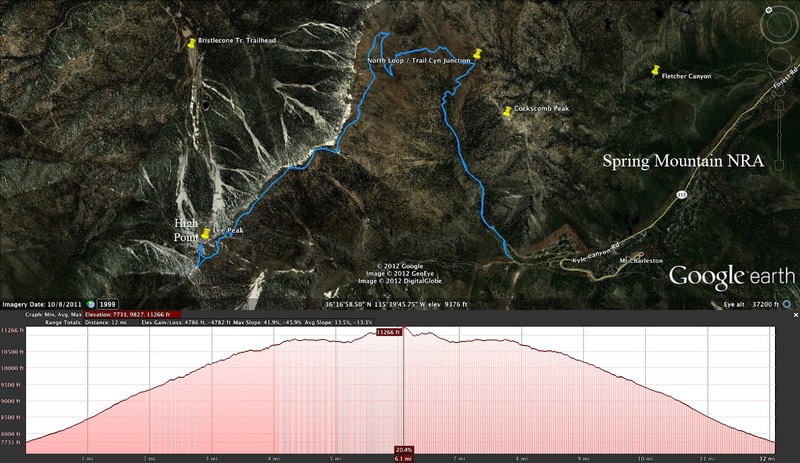 Most of the two groups were getting down the trail at the same time and the eight mile journey with a maximum of 2000 feet of elevation gain was done. The rest of the afternoon would be spent in recovery! Stream crossing on the Ruby Crest Trail. Kay enjoys the cold water at the end of the 8 mile hike. Large waterfall above meadow in Thomas Canyon. 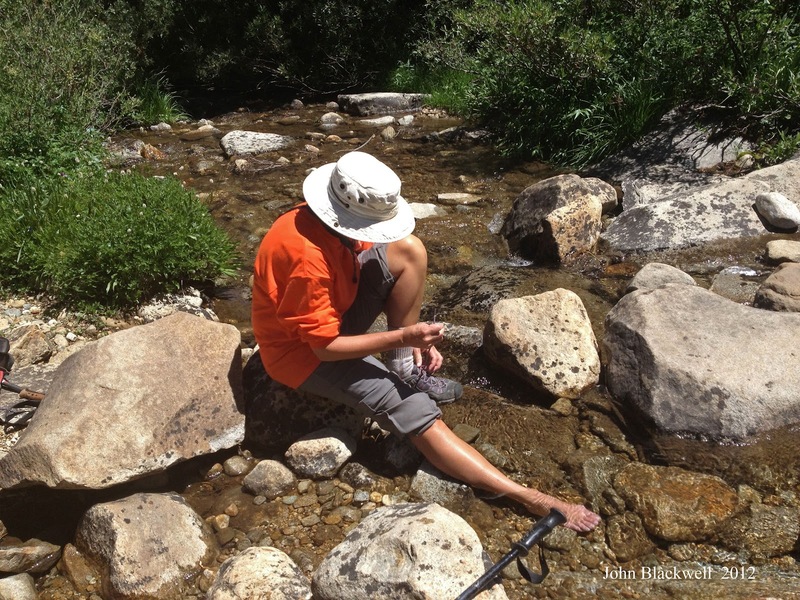 The originally scheduled hike for Wednesday was the Right Fork Lamoille Creek. 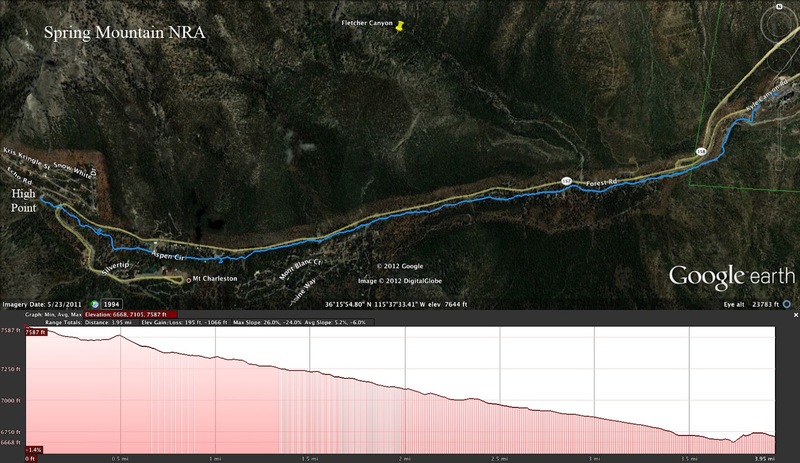 We changed the hike due to an unforeseen elevation gain of 3000 feet in a short distance. So, we happily turned into the Thomas Canyon Campground off of the Lamoille Canyon road where there is a trailhead for Thomas Canyon. We parked across from the campground host's RV and walked around to the back side of the campground where there is a sign indicating "Trailhead." Hikers enjoying the scenery in Thomas Canyon. 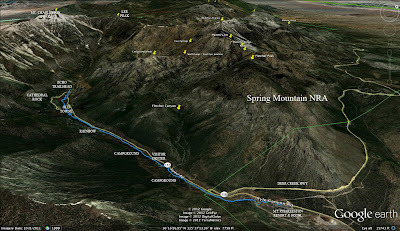 The hike followed a creek up towards a pointed peak at the source of Thomas Canyon. The creek had many photogenic waterfalls and we stopped at every one! At the midway waterfall seen to the right, we missed the switchback going up the hill to our left and continued on a spur trail that led to the creek and stopped. Backtracking, we found our way over to the real trail and continued. After this, the narrow trail led steeply up with the grasses and bushes hanging over the dirt path. John hikes through the large meadow of Thomas Canyon. Hikers enjoying their break in the meadow. 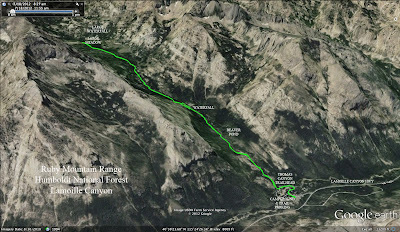 Finally, the trail flattened out and began crossing a huge meadow area at the source of the canyon. We passed a small pond and reached a rocky area where we sat for a break in "heaven." Surrounded by three towering mountain walls, we watched as three of our hikers made their way over to a large waterfall for an up close and personal experience with the water. The entire waterfall is seen in the photo at the top of this hike's entry. Although we heard from other day hikers that this was a very dry year for Lamoille Canyon and that the waterfalls and wildflowers are usually much more abundant, we were still very impressed with the lushness of the hikes. After all, we are used to hiking in and around Las Vegas where we get excited when we see a little bit of water sitting in a puddle! We had a better view of the large beaver dam and pond on the way down (seen to the right) and we tucked another five miles and 1300 feet of elevation gain into our pockets. 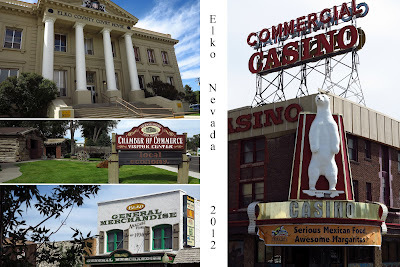 We finished the day's hike around 12:30pm so everyone was out and about this afternoon taking in the sights of Elko, Nevada. At the Chamber of Commerce, we learned that Elko produces the most gold in their mining after four other countries in the world. The miners work very hard with a schedule that would challenge just about anyone. They work 3 days of 12 hour shifts, get 1.5 days off, then work 3 nights of 12 hour shifts. 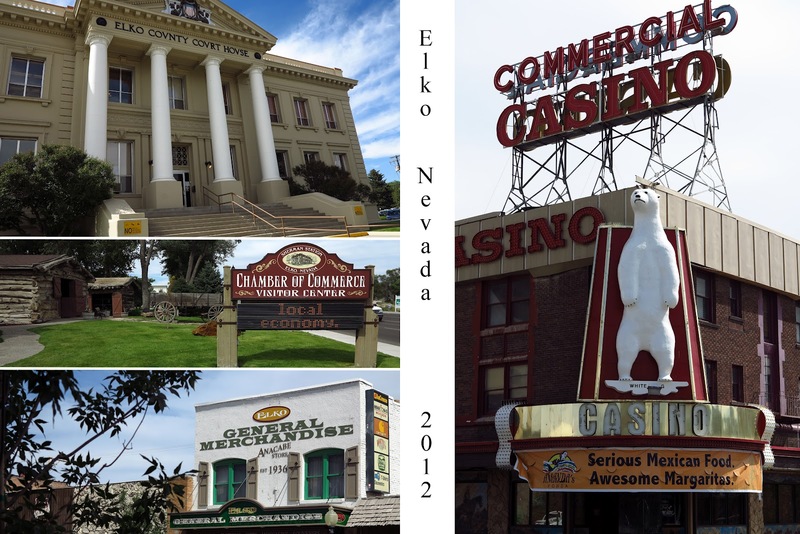 To quote the lady there, "There are a lot of 'zombies' running around in Elko!" There is a tour of mines done on Thursdays. Apparently there is a large emigration of Basque people in the area. Many of the club members got together for a special Basque dinner this evening. 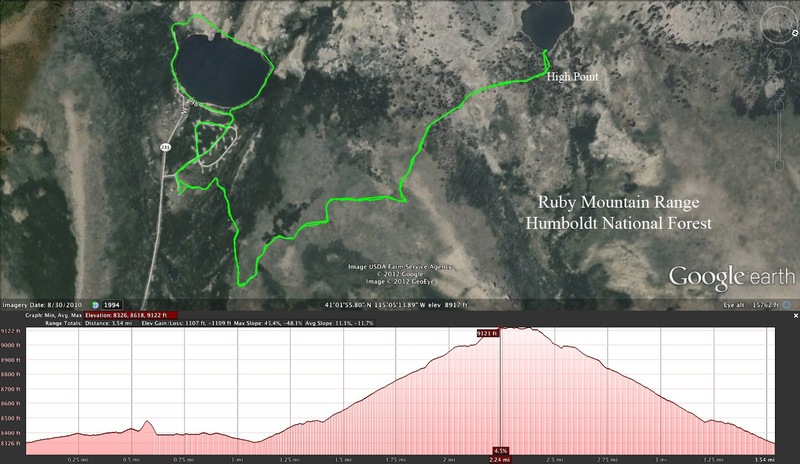 Thursday morning brought another day of excitement in the Lamoille Canyon recreation area. 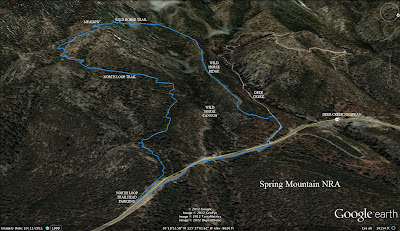 We again drove out to the large parking lot at the end of the road and began hiking in the opposite direction up the side of the mountain on a very long switchback. Over the next two miles, there would be nine switchbacks and one bridge crossing on the very steep terrain. Because of the switchbacks, the climb was made easy. Photo Op from bridge on Island Lake Trail. All of the bridges on Lamoille Canyon hiking trails are made of railroad ties and the one we crossed here was no different. The creek that we were crossing went nearly straight up and down underneath our feet. Five more of the nine switchbacks brought us to Island Lake; an alpine lake that had a small treeless island in the middle of it. It was surrounded by three mountain walls and the openness of Lamoille Canyon. View of Island Lake from halfway up to Thomas Peak. 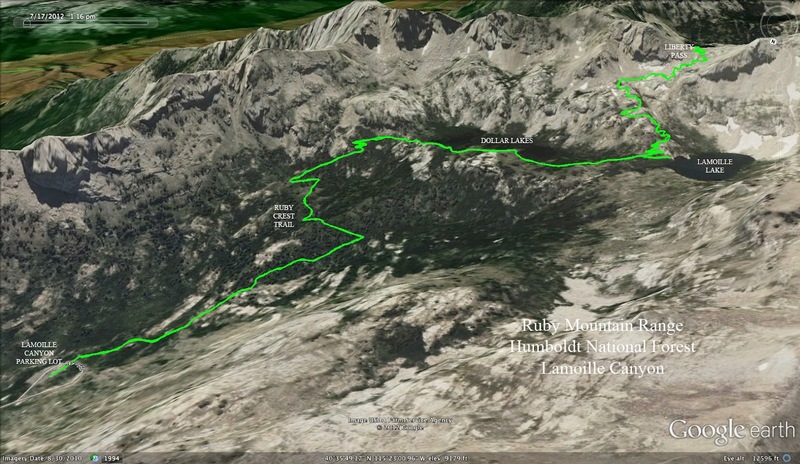 From this point, five hikers decided to try and climb one of the surrounding peaks called Thomas Peak. Two hikers began climbing with them then detoured to a nearby marsh on the second tier of levels. Two more hikers took a different trail to the marsh area. One hiker hiked around the lake and one hiker just explored. The climb to the lake was fairly moderate so many of the stronger hikers were not interested in stopping there. There was also a stream that fed into the lake below from the marsh. It seemed that everywhere you looked there were places to photograph and enjoy. Marsh area on next tier above Island Lake. 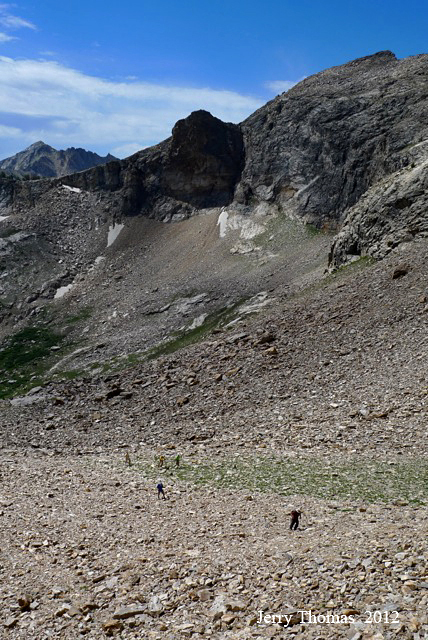 Five hikers approaching the 11,000 ft level on Thomas Peak. Out of the five hikers that attempted the 11,250 foot high peak, two hikers made it to the narrow top. Getting there involved a knife-edge walk with Thomas Canyon from the previous day's hike on the other side. The other three hikers made it up to the 11,000 foot mark fighting a scree field "on steroids" as seen in the photo to the left. In the photo below, Jerry took this photo of Paul sitting on the knife-edge below the peak. Hmmm. Looks dangerous but they said it didn't feel dangerous. Anyway, everyone hiked down at their leisure and another five miles was done. We didn't want to leave Lamoille Canyon but we all vowed to return next year. Stream feeding into Island Lake from above. Chris and Diane entering the new visitor center. Some of the exterior artwork. Eight club members went eleven miles west on I-80 from Elko to find the brand new Visitor Center dedicated to the California Emigrants Trail called the California National Historic Trail Interpretive Center. 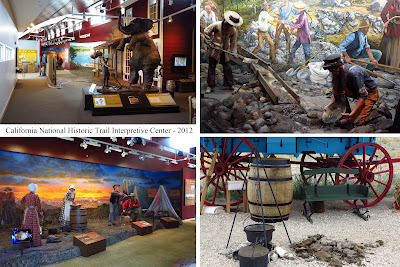 It is one of the nicest Visitor Centers of the BLM that this writer has seen with many displays and artwork. We attended a small talk on the issue of doctors and medicine on the trail. Many of the displays talked of the hardships that accompanied such an endeavor. It answers many of those nagging questions people have about what it was REALLY like. 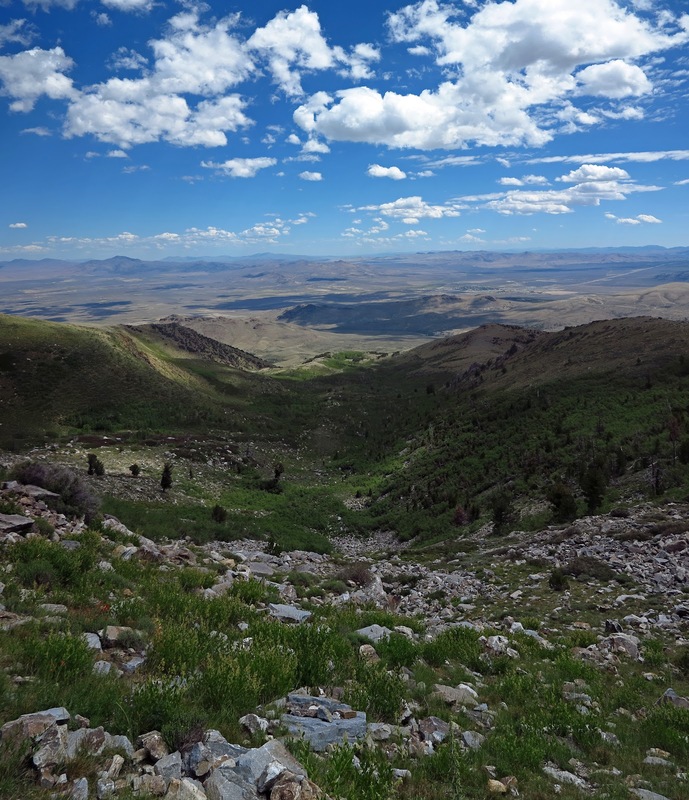 In the morning, many of the thirty-eight hikers left Elko to drive back to Las Vegas. Ten hikers decided to add one more hike to their feet before the long drive. They drove east on I-80 to exit 351 where a sign led to Angel Lake. We drove up a mountain road to the campground at Angel Lake and got out of our cars. Before starting our explorations, we met up with a lady ranger who was thrilled to have us visit her charge. Her German Shepherd dog was a big "hit" as he stared down a ground squirrel out of the window of her car. 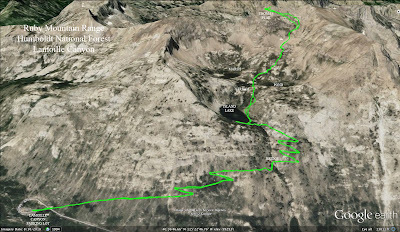 First, we took a stroll over to Angel Lake which was right there at the campground. Most of us hiked around the lake which would not have been possible if the water had not been so low. There wasn't a trail but that never stops us! After the short excursion, we headed back to where our cars were parked at the Smith Lake trailhead and up we went. John making friends with Chex, the horse. We passed through the gate and met up with a two year old horse named Chex and his rider. They had been up the trail clearing brush. We made sure that the gate would be closed again as the ranger lady had asked us to and continued up through the open field. We had to take a left turn at a sign indicating Smith Lake and climb up through some more of the field. After passing through a little stand of trees, we saw the final climb. Steep climb up to Smith Lake. This climb was steep and covered with slippery dirt. There were rocks stuck into the ground that helped with the footing. The group of ten got a little spread out as two hikers weren't sure that they wanted to continue. 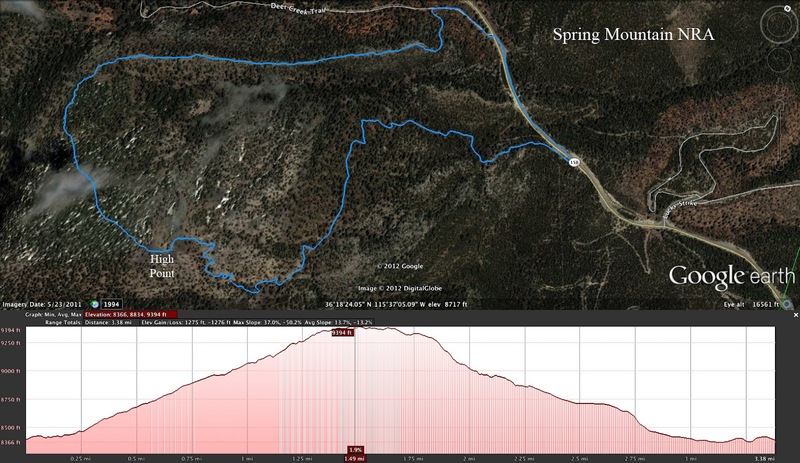 But, after this climb, there was a small downhill and then there was Smith Lake. The lake was surrounded almost completely by mountains and was quiet and peaceful. We enjoyed our break immensely. View to northeast from the Smith Lake Trail. Finally, we had to face going home to Las Vegas. It's not that we didn't want to go home; it was more that we didn't want to leave this little corner of heaven. So, we hiked down and got into our cars after almost four final miles. Maybe next time we'll get a photo of a mountain goat! Angel Lake from lower Smith Lake Trail.